If you're just joining us, where have you been the past five years? In 2012, I marked the 25-year anniversary of collecting my first ARIA top 50 chart from my local record store by starting this blog. Then, in 2015, I added a weekly 30 Years Ago... recap and have now reached the point where I began: the week ending July 5, 1987. 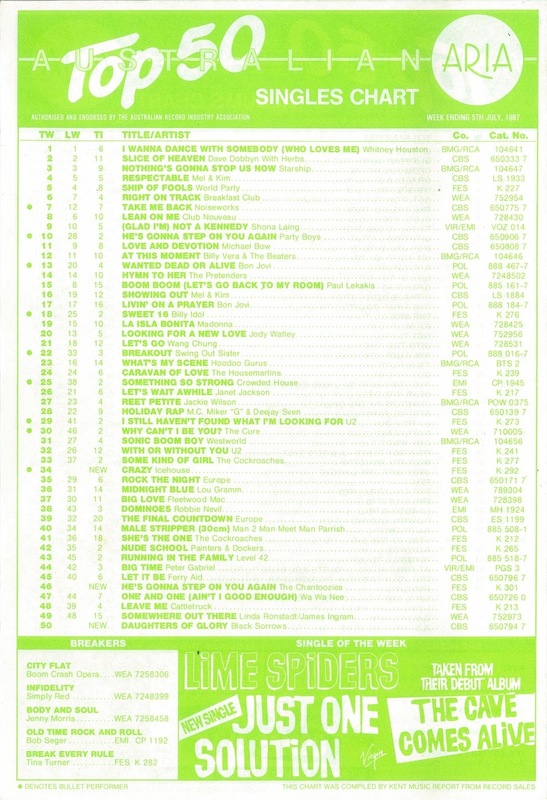 This time around I'm going focus on the week's new entries and cover the parts of the chart I didn't look at last time, namely the Single Of The Week, Breakers and those songs entering the top 100 that never made the top 50 (the Off The Chart section). The week's biggest new entry came from an Australian band who'd racked up a handful of top 10 hits early in the decade but had struggled to match that... until now. Before long, they'd even land their first number 1 single. At the top of the very first chart I collected was "I Wanna Dance With Somebody (Who Loves Me)" by Whitney Houston, which spent a third week on top. Top 30 single "Welcome To The Boomtown" didn't make much of an impression on me at the time, and I literally just listened to this follow-up and I couldn't tell you how it goes. Like previous single "Victory", this slice of pop/funk reached number 10 in the US and was all but ignored here in Australia. This was Kool & The Gang's final visit to the ARIA chart. A final chart visit for another excellent American funk act now - and The S.O.S. Band's first appearance on the top 100 at all since their top 20 hit, "Just Be Good To Me" in early 1984. Also returning to the chart - for the first time in two years - was Tom Petty And The Heartbreakers with this lead single from Let Me Up (I've Had Enough), which was co-written by Bob Dylan. Yes, it's nowhere near as good as "Slice Of Heaven", but I've always been surprised this sweet ballad, also from Footrot Flats: The Dog's Tale, didn't at least reach the top 50. Poor V-Capri. Try as they might, the rest of the country just wasn't that interested in the Western Australian band, and this single, which isn't even on YouTube, became their final top 100 placement. They'd release one more song, "Now I Know", in 1988. It's funny - I've been aware of this song for exactly 30 years now, since it was the Single Of The Week on the first chart I kept, but I've never bothered to listen to it until right now. Given it didn't even dent the top 100, I'm clearly not the only one who never gave it a chance. Thing is: I actually prefer this to their top 50 hit from earlier in the year, "Weirdo Libido". Is it just me or does this song seem to go on forever? And just when you think it's going to finish, there's an a cappella chorus at the end. It was about this point, if not a couple of singles earlier, where Tina Turner lost me for good - and it seems I wasn't alone, with the title track of Break Every Rule falling some way short of the top 20 placing of both "Typical Male" and "What You Get Is What You See". I'm now going to contradict everything I've ever said about Simply Red on this blog. Usually, I prefer the British soul band's upbeat songs to their ballads, but I think releasing "Infidelity" as Men And Women's second single (following "The Right Thing") was a mistake and they should've gone with eventual third single "Maybe Someday..." instead. There's just not a strong enough hook in "Infidelity" and, as a result of it under-performing, "Maybe Someday..." probably also suffered. He'd had two top 20 hits as Jo Jo Zep, 1979's "Hit And Run" (with The Falcons) and "Taxi Mary" in 1982, but by 1983, that era of musician Joe Camilleri's career was over and he formed a new band. The first two albums by The Black Sorrows consisted almost entirely of cover versions of old blues and R&B songs, and neither those nor third album A Place In The World yielded any charting singles. In 1987, the band released fourth album Dear Children, which had a rockier sound than their previous efforts, and second single "Daughters Of Glory" gained some traction. 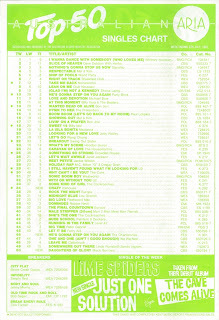 I actually quite liked the song - more so than a lot of what was to come from the band - but it disappeared from the top 50 after three weeks. It was the perfect plan (and by "plan" I mean "do exactly the same thing again"): take another hoary old rock song from 1971, throw a Stock Aitken Waterman-inspired beat behind it and have the four female singers give it their drunken karaoke night best (although this time they all got to have a go singing lead in the verses). If it weren't for those pesky Party Boys, Chantoozies would've had another top 10 hit to match "Witch Queen". Or would they? Because this version of "He's Gonna Step On You Again" is a mess. And matters aren't helped by the shambles of a music video that looks like so many terrible office Christmas parties. Even Bananarama at their most "can't be arsed" made more effort. I'm all for artists fooling around and having some fun in music videos, but at least film it well. I think it's safe to say Chantoozies learnt their lesson from this and came back with a much more polished attempt at being a professional pop group in just under as year's time. They'd maintained a steady stream of excellent releases since their initial burst of top 10 action between 1980-82, but the highest chart position Icehouse had managed in the past four-and-a-half years had been the number 14 peak of "Baby, You're So Strange", with many of their singles really under-performing. Finally, the band once known as Flowers came up smelling of roses (sorry!) with this lead single from the forthcoming Man Of Colours album. 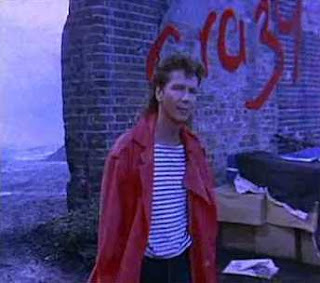 Not only did "Crazy" put Icehouse back in the top 10, but it became their biggest hit to date, beating the number 5 peak of "Great Southern Land". It was hardly a surprise - with its big, bold production and ultra-commercial hook, "Crazy" was only ever going to be massive. Who knew that it was only the beginning of an unstoppable year for the band? The song's two music videos are below for your viewing pleasure. Next week: well, I've already written the post for the following week (which you can read by clicking the link below), but I'll update it (and every subsequent post) to include the Off The Chart section. Congrats on your 5 year anniversary, been following your blogs since it started and look forward to my weekly dose. I'm pretty sure I commented on the original post of this 5 years ago, but here goes again... hopefully I don't repeat myself too much. I much prefer the red coat video for 'Crazy' over the literal-for-the-US-market dull second video. The red coat one seems to be a one-take shot, though with some careful editing to disguise scene changes. I remember seeing Chantoozies perform this track on Hey Hey It's Saturday, and, due to already being familiar with the Party Boys version, assumed it was just them doing a 'fun' cover on the show; not actually being their second single. It was rather underwhelming. Taking nearly a year to come back with 'Wanna Be Up' was a strange move, but it worked for them. The Lime Spiders track sounds like Hoodoo Gurus to me. Didn't know the S.O.S. Band or Kook and the Gang tracks before; they're good, though perhaps slightly dated-sounding for 1987.